Greece is ranked the 28th largest economy in the world. By comparison Ireland is ranked 36th. Needless to say, Italy represents a flash point in the euro zone as bond vigilantes have gone after it for the past two days. Fear is contagious as they say. Greece is the ostensible problem and the stated reason for today’s EU emergency meeting, but they will discuss Italy. Italy’s debt costs are still relatively low, but the Bund spread is growing and their cost of debt relative to the amount of debt (primary balance) is a problem. Is this something we here in Fortress America should worry about? Yes. Contagion is the big fear in the euro zone. If Greece defaults on its sovereign obligations that lends credibility to an unwinding of the euro because German and French taxpayers will ultimately and reluctantly foot that bill. That is because the biggest lenders to Greece are German and French banks, and like us, they would sacrifice a stance against moral hazard before they will see their banks fail (bailouts). There is no way Greece can pay back its debt to the European Financial Stability [Bailout] Fund or its other creditors in our lifetimes. And it is unlikely that they will be able to muster the courage to significantly cut back the large public trough and liberalize their economy in order to make repayment happen. Today the EU ministers agreed to “enhance the €440 billion [bailout fund’s] flexibility and scope,” which really means they will allow the €440 billion fund to buy Greek bonds on the secondary markets, thereby bailing out the banks. It will take the vote of each country to allow them to do this, so it’s not a fait accompli… yet. But it is easy to visualize creditor banks lining up at the fund window, Greek bonds in hand. 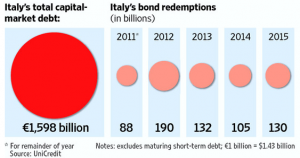 Also, it is likely they will restructure Greek bailout debt with longer maturities. This will amount to a default as far as the rating agencies are concerned. The markets will react negatively, and money will flow into Treasurys. Bund spreads are high and sovereign rates on PIIGS have been climbing. Yesterday (Tuesday)10-year yields on Greek, Portuguese, Irish, Spanish and Italian debt fell sharply which means the ECB intervened in the market to allay fears. But, they can’t do that long enough to keep the vigilantes away. As the world’s eighth largest economy, Italy’s problems are Europe’s problems, and Europe’s problems are our problems. About 16% of our exports go to Europe. The more the euro zone is roiled with default problems, the more hot money will flow here and ultimately increase the dollar versus the euro. While your European vacation will be cheaper, exporters to Europe will take a hit. But the “modest” amount is more problematic that it would look. They will probably get through 2011, with a little help from euro zone friends, but with a declining economy and a poor economic future, rising borrowing costs could leave them little room to maneuver. Like Greece, the rest of the EU is demanding Italy cut spending and bring their budget in line with reality. Berlusconi has proposed a €43 billion austerity package, and the opposition was quick to agree to do it with “‘very few’” amendments to the budget plan in order to speed the bill’s passage.” I wonder what “very few” really means. His administration’s hold on power is tenuous. The declining competitiveness of Italy’s exporters and higher labour costs might cause the economy to grow below its potential, further eroding the country’s fiscal position. Before the euro zone was created, Italy improved its competitiveness through devaluation of the lira. A single currency limits Italy’s ability to adjust its exchange rates to local conditions and leads to lower economic growth and excess unemployment. They worry that Italy’s debt cost will rise, that GDP will decline, and the projected 2014 budget surplus of 3% is not likely to be achieved. That becomes very likely in light of the fact that Europe’s economies are declining. Anticipated revenues will fall short of projections. One factor behind bond markets’ growing instability is a sense that the euro zone’s basic strategy for dealing with debt problems — keeping countries afloat with emergency loans in the hope they can grow their way out of their debts within a few years — is flawed. More radical action to cut the countries’ debts or boost economic growth may be needed. ECB raises interest rates more than what they just did. Individual countries will default. Most likely Greece, Ireland, Portugal. Maybe Italy and possibly Spain. Rollovers and extended maturities as part of a workout would be considered to be a default by the rating agencies. The euro will decline. I recently suggested that the euro could fall below the dollar, but perhaps that was reaching a bit; it all depends on how things transpire, which is the problem with forecasts. Germany, France, and Belgium will bail out their banks. The ECB will buy their bonds thus expanding money supply (currently it is shrinking). Weak countries will exit the euro zone and devalue their currencies as often as needed.